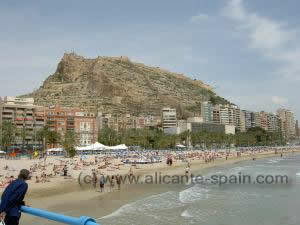 The city of Alicante Spain! Alicante, and it’s wonderful boulevard with palm trees and shopping streets, is one of the most well-known towns along the Costa Blanca. Known for its miles of sandy beaches, Alicante is a starting point for thousands of tourists every year. With many historical buildings around the entire city, Alicante offers countless sightseeing attractions, from cathedrals to churches and of course a wonderful harbor area. Additional to sightseeing, direct from the harbor area, a long wide sandy beach leads its way up to San Juan. Just drop your towel on the sand and enjoy a wonderful day in the sun. 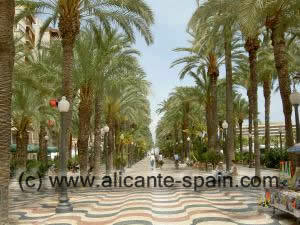 Alicante’s location: The Costa Blanca lies on the east coast of Spain. to the south is the Costa Almeria and to the north, the Costa Dorada. 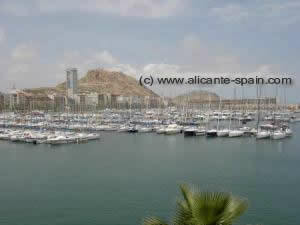 Alicante has about 340 000 inhabitants and lies directly at the Mediterranean sea. Language in Alicante: Two official languages are spoken. Spanish and Valencian, but you will get almost everywhere with English and/or German.